Kathryn Bigelow's Zero Dark Thirty is a grueling masterpiece that captures the hunt for bin Laden with a daunting amount of realism and efficiency. Never before has the war-on-terror been shot with such a cold dose of reality. Kathryn Bigelow’s Zero Dark Thirty isn’t exactly the war film that most were expecting — offering viewers realism and truth and a chance at watching it unfold in a grueling matter. Zero Dark Thirty is Bigelow’s greatest achievement and one of the most important pieces of cinema of the last decade. Now, Sony has finally brought it to Blu-Ray in a combo pack that’s well worth the purchase. Maya (Jessica Chastain) is the woman that brought down one of the world’s most wanted terrorists, Osama bin Laden. The American government has been after the man for decades, but finally after all of this time he’s been brought down thanks mostly to the efforts of Maya and dozens of other men and women. Zero Dark Thirty isn’t your traditional war movie. It doesn’t spend a small portion of its time establishing its characters before moving onto the Hollywood action or over-dramatization of real-life events. Director Kathryn Bigelow (The Hurt Locker) instead chooses to film Zero Dark Thirty within a structure that eventually boils over in a remarkable fashion. The film is a grueling experience and one that simply cannot be watched and forgotten. It sinks its teeth in early on, keeping the unsettling idea of torture burned into your brain as the film slowly progresses. 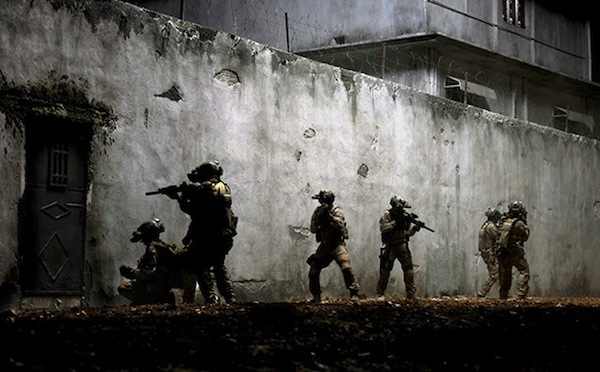 If anything, Zero Dark Thirty is a patient man’s film, revealing small tidbits of information as Maya and her various associates uncover bin Laden’s whereabouts or previous allies. The film’s pacing alone is an achievement to be honored, tightly cutting back and forth between Maya’s exhausting hunt for bin Laden and her constant inner-struggle to never give up, even when faced with a complete dead end that promises her nothing. Actress Jessica Chastain grabs hold of the film early on and never lets it up for a single second. Her performance can be described as grounded and calm one minute and then explosive and unpredictable the next. Maya is a woman that doesn’t take no for an answer, even if higher up officials are constantly telling her that what she wants can’t be done. Her dedication to the mission not only fuels herself but those around as well. Chastain captures this with an electric force that presents emotion as stripped away fragments of a human forced to do unbelievable things to accomplish an important and possibly life-changing task. Chastain isn’t alone though. She’s surrounded by talent of all levels, with Jason Clarke, Kyle Chandler, Chris Pratt, Joel Edgerton and Mark Strong all making small, but memorable appearances throughout the film. Zero Dark Thirty rests on Chastain’s shoulders, but she’s always interacting with strong talent and that only helps to keep the film level and never without a pulse. Kathryn Bigelow really is to be commended for her direction. With Zero Dark Thirty she’s never afraid to show things that most would deem as uncomfortable. She presents everything as is and never spends too much time on the obvious backdoor politics. 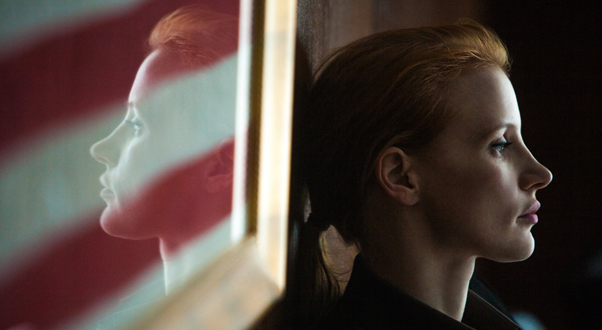 Zero Dark Thirty is a political film to an extent, but it’s also so much more. It’s not even really a traditional war film when you break it down. It instead acts as a gripping film that in years will be looked at as an important piece of cinematic history. Never before has a director achieved such success in telling a story in this particular way. Zero Dark Thirty is a film that depicts the long-lasting struggle of terrorism with close realism, rarely glorifying and never dumbing down or Hollywoodizing important parts of the film to get a rise out of the audience. This is expert filmmaking done with the idea that the audience wants to see smart and airtight cinema, even if it means not spelling out each and every stroke of the pen. Sony almost always brings the goods when it comes to porting over a film to Blu-Ray and Zero Dark Thirty is certainly no exception. The film’s HD presentation looks remarkably crisp and layered for a digitally shot movie. It doesn’t achieve the heights of a movie shot traditionally on film, but it looks stunning from head-to-toe. Black levels are rich and the sun-soaked imagery of the various locations are sharp and full of texture. The 5.1 DTS-HD Master Audio track is another demo-worthy track that Sony hits out of the park. The film’s focus is mostly dialogue, but the scenes that do involve gunfire and explosions pop to life with active force. The last 30 minutes stand out as the film’s most impressive moments and the audio track balances the delicate and quiet moments with the crackling gunfire. I find it somewhat disappointing knowing that Zero Dark Thirty barely took home any Oscars, but sometimes the best films of the year go by mostly unnoticed. At least Kathryn Bigelow’s film received its fair share of critical praise and general positive word-of-mouth from most audiences. Zero Dark Thirty is something that might not be fully understood now, but will soon be talked about as one of the best films not just of 2012, but of the past decade. Sony’s Blu-Ray of Zero Dark Thirty is a little light on the features, but strong where it counts, which is the film’s video and audio presentations. Owning this film is a no-brainer, simply because Kathryn Bigelow has constructed one of the finest films that I’ve ever seen, even if it tackles such unsettling material. Zero Dark Thirty isn’t for those looking for a quick couple of hours of escapism, but instead a film that’ll make you think long after the screen goes black.